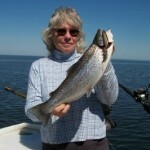 Lake Ontario Salmon Fishing…, Unbelievable for April! 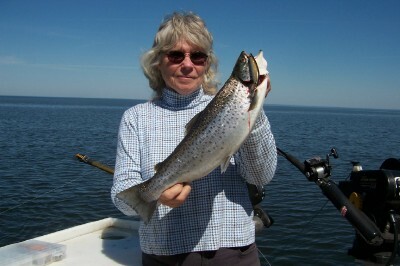 Every spring in the Oswego area ofLakeOntario, fishing starts off with a bang in April. Brown trout, coho salmon, rainbow trout, lake trout, and occasional Atlantic salmon, aggressively feeding in the warming water near the mouth of theOswegoRiver make for some exciting light tackle trolling. King salmon in the shallows are a rare April catch, normally not showing up until early May, and even then, usually in deeper water offshore. Seeing gulls working bait inside the harbor breakwalls, I knew we wouldn’t have to go far to catch fish. With only three lines in the water, one of the rigger rods snapped upright, and Garrett was into the first brown trout of the tripit. On our second troll past theOswegolighthouse, the rod didn’t spring upright when the fish jerked the line free of the downrigger release. Instead, the ultralight 6’ rigger rod doubled over, the drag on the 5500LC ABU Garcia levelwind reel screeching as an unseen monster with a #44 Sutton in it’s mouth peeled two hundred feet of 10 lb. test line from the spool. I knew before the fish ever stopped running that it was a king. After a give and take battle, the silvery king came to the net, later pulling a digital scale to 17.8 lbs. In the next five hours we boated around 30 trout and salmon, four of them silvery spring kings. Three of them were caught just inside the entrance to the harbor, the fourth just outside. 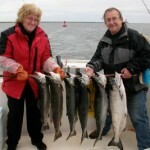 Since then, we have boated king salmon on almost every charter trip. I have fishedLakeOntarioin the spring since 1978, and never, ever have seen so many king salmon caught in April offOswegoHarborand Nine Mile Point inMexicoBay. Why this is happening this year, no one knows for sure, but it does coincide with one of the warmest months of March ever. Water temperature inOswegoHarborin late March reached 55 degrees, compared to normal temperature ranging from the mid30s to low 40s. By early April, this warmer water from theOswegoRiverflowing east to Nine Mile Point attracted hordes of alewives and king salmon followed them. Ever since, the April salmon fishing inshore in water less than 50 feet deep has been better than any I’ve ever seen. On my last charter trip, Patty and Dave McMahon, who have fished with me for 15 years, including on many spring trips, could not believe it. Leaving the dock at Oswego Marina at6:00 AM, it was only a 5-minute run to 40 feet of water where I had been catching kings. We set up our lines with a dodger/fly on one corner rigger back 15 feet and down 30 feet, and a spoon on the other corner rigger at the same depth, but back 25 feet. Spoons were rigged on two Dipsy Diver rods, plus two leadcore lines fished from the planer boards. By 9:00 AM Pattyand Dave had boated 6 kings up to 18.8 lbs. and lost several others. Along with the salmon they boated 6 browns up to 12.7 lbs., plus three lake trout. At one time, they had 5 fish on at once, three of them kings. They released all but four king salmon and two browns. Once the king salmon move into theOswegoarea andMexicobay, they are usually there thru the rest of the season.. If this happens this year, there is no question that 2012 will be one of the best king salmon seasons ever. 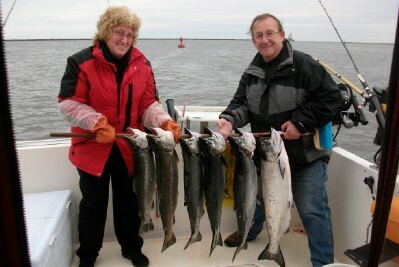 If it never happens again, you can be sure that no one who has fished theOswegoarea this April will ever forget the early spring king salmon fishing of 2012..
Dave and Pat with a few of the 6 kings and 6 browns they boated by 9:00 AM on 4/26/12. It is hard to believe that the spring fishing could be as good as it has been the past few weeks in the Oswego Area. I had been listening to the reports, including from my son Capt. Jeff, about catches of spring browns…, 20, 30, 40 fish per trip. Meanwhile, my charter boat sat in the water at Salmon Country Marina on the Little Salmon River while I waited for the wind to stop blowing. It’s only 11 1/2 miles from the mouth of the L. Salmon to Oswego Harbor, but with the wind blowing up to 36 knots and with seas running anywhere from 2-4 feet to 7-9 feet, it would have been a bumpy ride into west or northwest winds, especially coming around Nine Mile Point. Finally, with a charter scheduled for Monday morning and a 25 knot wind pushing seas to 3-5 feet, I decided on Monday(4/7) morning, it was time to depart, despite the weather. After a bumpy 45 minute ride, I pulled into Oswego Harbor. With the seas so rough there wasn’t a single boat fishing outside the harbor, but, man, were there ever boats inside the harbor! After carefully weaving my way around boats, planer boards, and long lines, I finally made it to Oswego Marina where I moor my boat. Although the Saturday morning bite in the harbor had been slow, news from the dock was not only were the browns biting in the harbor on Friday, 6 kings up to 18 lbs. had also been caught. Sunday dawned calm and sunny. It was time for a shakedown cruise. My wife, absolutely loving fresh broiled brown trout filets, agreed to go out with me to check out the boat, electronics, riggers, etc. We left the dock at 10:30 AM and returned at noon. In 1 1/2 hours in the bright sun and crystal clear water we boated 7 browns, one rainbow, one coho salmon, and two Atlantic salmon…, unbelievable spring fishing. Oh, yeah…, my Monday charter, as well as my Wed charter were both a blowoff. Yes, Lake Ontario gives up her treasures grudginly. 2-yea old April browns like this are plentiful this spring.